Wine Corks - Synthetic Nomacorc #8 "VHN" - 100 ct - F.H. 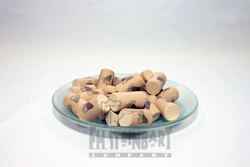 Steinbart Co.
Nomacorc's Wine Cork with its patented co-extrusion manufacturing process creates engineered closures with a foamed core and an outer skin. These two elements work hand in hand to create predictable and consistent preservation results.